Bureaucratization is an inalienable feature of modern society. Everyone had already resigned long time ago, that state is going to fix every moment of reality of its citizens. But, since in Ukraine the efficiency of the state machine is extremely low, then a lot of facts about its citizens and their real estate fall out of the field of visibility of the system. Till the a certain stage of this ignorance of all suits, but in a crisis situation, this creates tremendous problems for people. 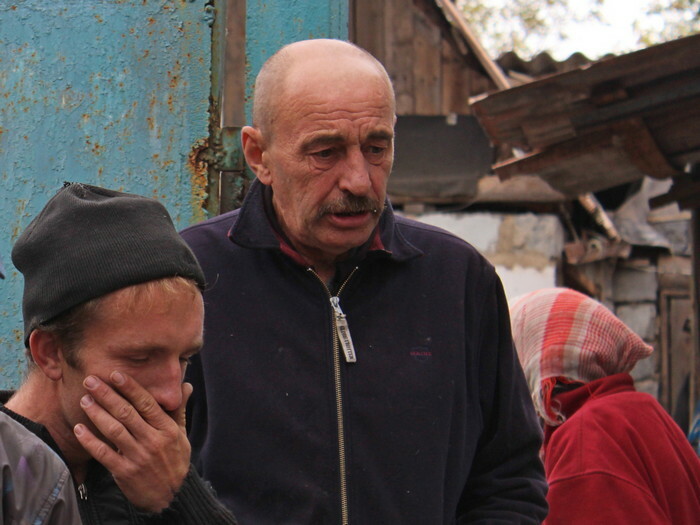 How do the residents of the front-line territories of Donbass live without documents? Informator.media found out. Can person live in Ukraine for 26 years, managed to born two children, one of them have already gone to school, regularly cross the checkpoints without having a passport? It seems that it really impossible but still, it is such a person who lives in the village of Vidrodzhennia of Bakhmut district of Donetsk region. Ekaterina Savemnok was born in Belarus in summer of 1991. Soon, her 17-year-old mother moved to Ukraine together with her. USSR collapsed on the eyes. The family was going to remove from one part of Soviet Union to another but following to the railway station they found themselves in the independent Belarus and then they went to already independent Ukraine. And there was no time for the ‘all splinters of empire’ to watch for the destiny of owns inhabitants without saying that there is a need to take care about having all necessary documents in hands. Ideal time to get lost. However, what motives Ekaterina’s mother had is the enigma. She couldn’t explain them, because she was drunk enough closer to noon. Ekaterina was absent too. But two of her children were running in the yard, looking with interest on the strangers. An oldest kid has gone to school this year. Locals are still wondering how he was taken there. The only documents that confirm the existence of brothers are the extracts from Bakhmut maternity hospital. The neighbors clearly understand that if nothing changes, so the the question of deprivation of parental rights is compulsory appear. ‘She has so a lot rights as my cat, but I’m worrying about her’, local activist Ludmila Ivanovna told, referring to whether the cat, or Catherine, or both. The house, in which 66-year-old Vladimir lives with his wife, his family had bought already in 1981. But it was registered on his father, who missed few years ago in Enakievo (NGCA of Donetsk region – ed.). They had the corresponding certificate, but when it was needed to re-arrange the house, then, here’s the trouble, got lost. ‘It could be possible to restore. Did you apply to police?’, I ask a man. ‘We applied. 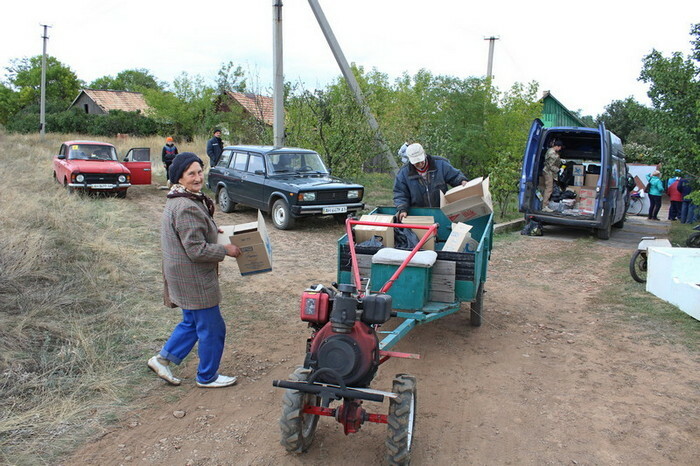 They said to us in Svetlodarsk: ‘Go to Ebakievo’. So, how will I go? There is other situation there, without saying that I even can’t go by foot up to kilometer’. Raisa Vladimirovna, Vladimir’s wife also begin to take in the conversation. ‘They also suggested: ‘You can say that it has been lost yesterday’. So, how yesterday? We had a certificate, somewhere it was fixed. He didn’t receive pension this time, it wasn’t waged for him. After that I specially went to Pension fund and knew about details of it’. The most wonderful is that spouses managed to get into the same situation twice. They bought a house before a war for their daughter. But she left and went to Kyiv, when war started. Neither her, nor her 15-year-old son were in the village from that times. In time of one of shellings, the roof of bought house was spoiled by splinters of shell. And it turned that it’s impossible to repair it for money of the international humanitarian organizations, because the documents were registered not ene on the neighbor, who sold the house, but to her relative, who died in 2011. ‘1000 UAH (~$38) are needed to prove that she is a heiress, and then she has to alter documents – they are six thousand (~$228)’, Raisa Vladimirovna tells with amazement. Such money neither neighbor, nor Vova with Raisa don’t have. 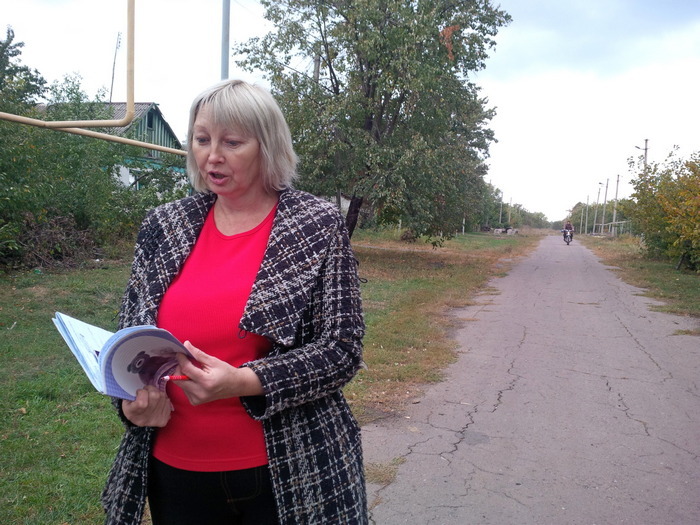 We talk with 56-year-old Nickolay Ivanovich in the neighborhood village Krynychne. His house was taken by military. After that he lived and worked in Kamenskoe of Dnepropetrovsk region. He came back two weeks ago. That;s great that he have where to. The sister of his mother bequeathed her flat in neighbor Mironovka to Nickolay. ‘When there were battles, the mine flight into my house. It fell down near the fence. I took my things and went to Mironovka. I came in the morning and there are military. They said: ‘So, do you have docs on your flat? Ok, we’re seizing it’, Nickolay calmly remembers. ‘The owners, who sold it to me, didn’t have documents on a house. They were burned. I decided to made them later, but even archive didn’t have them. So, it left unregistered, nowhere-nothing. I simply lived, got a little farm, payed for land’. 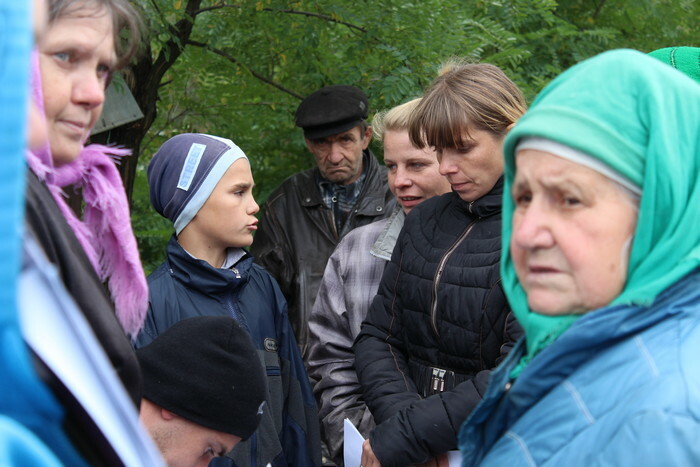 The only person who didn’t register for a long time, but finally registered the necessary documents – Jenya, removed with four children in the end of 2016 from occupied Makiivka to Myronivka. Jenya didn’t have any funds except the help from not so long ago removed there sister. But she wasn’t in a hurry to register IDP status, which could allowed to her get payments for children. The woman made it only in 2017 and first money she will get only after three months after the registration. People, denying a state, exist as long ago as the state. Someone took such a position for ideological reasons, someone – on religious grounds. But there are hardly any places in Europe where people ignore the need to receive documents simply because ‘it seems as if it’s going to happen’. Alas, practice shows that such an approach does not end with anything good.